Here’s a quick tutorial on something you might have been wondering about. 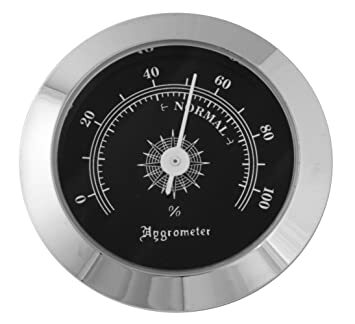 To calibrate your hygrometer you will need: table salt, a transparent container that is capable of being sealed (a Ziplock bag will do just fine), and another shallow cup or bowl. Put a teaspoon of salt in the shallow cup or bowl and add a few drops of water. (But not enough to dissolve the salt). Shake the damp salt into your see-through container and then insert the hygrometer. Close the container tightly. Let the damp salt sit in the sealed container for at least 6 hours, keeping an eye on the hygrometer without opening the container. The hygrometer should be at 75%. If it’s any less or any more, the difference represents how many points you need to add or subtract. (So, for example, if your hygrometer reads 65%, you will need to add 10 points). If you’re working with an analog model, simply adjust the needle by turning the screw on the back of the device to make sure the device is set to 75%. Remove the hygrometer from the see-through container and place it back inside your humidor!